A nice family game about trading in Hamburg harbor. By using a cleverly designed auction system players try to acquire goods, contracts and other victory point sources: First come, first served, but first served pays most. With only a small amount of money in circulation, players are always in a cash squeeze. Clobbering once in big style means taking half-measures for the rest of the game. 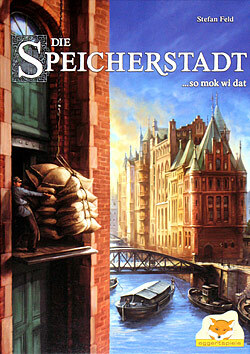 With “Die Speicherstadt” Stefan Feld and Eggert-Spiele managed to release an impeccable game.